With these tools and supplies on hand (most of which you already have), you will be prepared to handle the most common orthodontic emergencies. 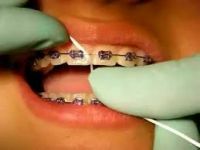 This is not an emergency, but can be a little uncomfortable or embarrassing for the braces-wearing patient. It is easily fixed with a piece of dental floss. Try tying a small knot in the middle of the floss to help remove the food. 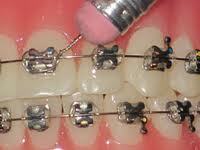 Or use an interproximal brush (“tree” brushes) or toothpick to dislodge food caught between teeth and braces. Tiny rubber bands or small wires, known as ligatures, hold the wire to the bracket. If a rubber or wire ligature is lost, notify Partrick Orthodontics so we may advise you as to whether or not the patient should be seen. When a ligature pops off or breaks, missing or broken ligatures should be brought to the attention of Partrick Orthodontics so we can advise you as to whether or not the patient should be seen in the clinic soon. It’s normal for a patient to have discomfort for a day or two after braces or retainers are adjusted. But it can make eating uncomfortable. This discomfort is both normal and temporary. Soft foods should compile the bulk of your diet. Rinse the mouth with warm salt water. If the patient is allowed to have over-the-counter pain relievers, acetaminophen or ibuprofen may be effective. Occasionally the end of a wire will work itself out of place and irritate the patient’s mouth. Use a Q-tip or pencil eraser to push the wire so that it is flat against the tooth. If the wire cannot be moved into a comfortable position, cover it with relief wax. (See Irritation of Cheeks or Lips above for instructions on applying relief wax.) Contact Partrick Orthodontics so they can be aware of the problem. 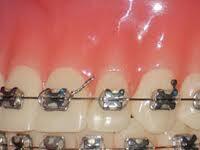 If the braces have come loose in any way, call Partrick Orthodontics to determine appropriate next steps. If the bracket is off center, the adhesive may have failed. Contact Partrick Orthodontics and they will help you determine the course of action. 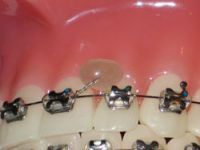 If the loose bracket has rotated on the wire and is sticking out, and the patient cannot immediately be brought to Partrick Orthodontics, you can do a temporary fix to alleviate discomfort and prevent further damage. But take care to prevent swallowing or other injury. This is rare, but when it does happen, it can be fairly alarming to the patient. Remain calm. If the patient is coughing excessively or having difficulty breathing, the piece could have been aspirated. If you are able to see the piece, you may carefully attempt to remove it. But do not make the attempt if there’s a possibility that you could cause harm. If appropriate under the circumstances, examine the patient’s braces for problems that may result from the missing piece, such as looseness or irritation, and treat as specified above. If you are unable to see the piece and believe it may be have been aspirated, notify the parent/guardian and Partrick Orthodontics immediately. The written information above is from The American Orthodontics Association’s Handling Orthodontic Emergencies handout.